Click or call +1.703.435.5335. We’re here to help! The ACRM Cognitive Rehabilitation Manual; Translating Evidence-Based Recommendations into Practice is a significant contribution to the field of brain injury rehabilitation. Never before have research outcomes been so accessible for use in everyday clinical practice. The Manual — all 150 pages, including clinical forms — is a practical guide for the implementation of evidence-based interventions for impairments of executive functions, memory, attention, hemispatial neglect, and social communication. Get the lowest price available when you order from ACRM online. 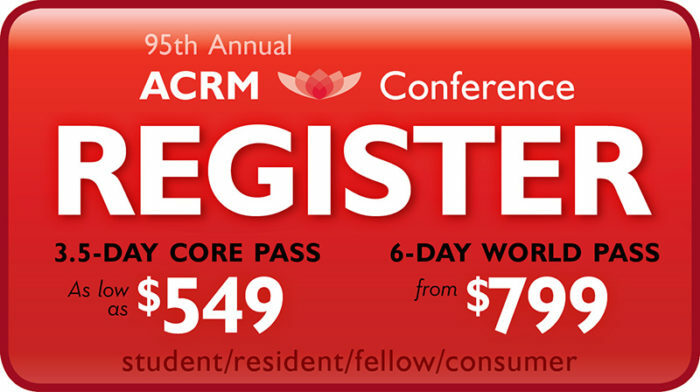 Click on the “Buy Now” button and either login to your existing account via the ACRM Portal, or complete the New Visitor Registration Form if this is your first time logging in. Select the material you wish to purchase, add it to your cart—your fees will automatically be adjusted based on your membership status. Continue following all of the prompts until you have remitted payment and receive a confirmation. You will receive the manual within 2 business weeks. If you wish to purchase 5+ manuals, please contact Jenny Richard for special pricing. If you prefer to purchase by mail, please Download Order Form here. Contact Jenny Richard, Director Member Services, +1.703.574.5845, with any questions. Not sure the Manual will meet your needs? Download the Table of Contents to examine the in-depth collection of evidence-based research practices presented and the index of tools and worksheets. The Cognitive Rehabilitation Manual; Translating Evidence-Based Recommendations into Practice is a significant contribution to the field of brain injury rehabilitation. Never before have research outcomes been so accessible for use in everyday clinical practice. The Manual is ideally suited for clinicians who have had some formal training in cognitive rehabilitation, and who have experience working with individuals with brain injury (e.g., traumatic brain injury, stroke). The interventions described can be readily used by occupational therapists, speech and language therapists, psychologists, and other rehabilitation professionals. The Brain Injury Interdisciplinary Special Interest Group (BI-ISIG) of the American Congress of Rehabilitation Medicine (ACRM) is committed to fostering the use of empirically supported interventions to improve the lives of individuals with brain injury. A series of reviews, which are published in the Archives of Physical Medicine and Rehabilitation (Cicerone et al., 2000; 2005; 2011) have reviewed the scientific literature and put forth standards and guidelines for clinical practice based on the quality of evidence available for each intervention. The Cognitive Rehabilitation Manual operationalizes or “translates” these guidelines into step-by-step procedures that can be used by clinicians who treat individuals with brain injury. The volume is organized into six chapters. The introductory chapter compiles the clinical wisdom of the authors into a practical roadmap for structuring and implementing cognitive rehabilitation interventions. Treatment considerations and patient factors that may influence the course of treatment are discussed, and a guide to goal-setting that is applied throughout the manual is introduced. Subsequent chapters present practical guides for the implementation of evidence-based interventions for impairments in each of the following areas: Executive Functions, Memory, Attention, Hemispatial Neglect, and Social Communication. The content of each chapter draws from empirically-supported rehabilitation interventions included in the Cicerone et al. reviews (2000; 2005; 2011) and the collective clinical experience of the authors of the Cognitive Rehabilitation Manual. Wherever possible, step-by-step guidelines for implementing each intervention and setting relevant individual goals are provided, along with clinical recommendations for tailoring and modifying the intervention according to patients’ needs. In cases where in-depth treatment manuals exist, full references and links to these materials are provided. Additional appendices include rubrics for goal-setting in each of these domains of functioning, and handouts or worksheets that can be used to record and evaluate progress. This important volume will raise the bar in cognitive rehabilitation by aiding clinicians in delivering high-quality, empirically-supported interventions to improve the lives of individuals with brain injury. Hear What Others are Saying About the Manual . . .
… a landmark volume – translates decades of research into clearly described procedures indispensable for working clinicians … an invaluable guide to the evidence-based practice of cognitive rehabilitation for clinicians with or without strong research backgrounds. Thoughtfully organized, practical, and invaluable — this ACRM/BI-ISIG Cognitive Rehabilitation Manual provides step-by-step techniques for delivering cognitive therapies. This promises to be an essential guide to the delivery of cognitive rehabilitation services for persons with brain injury. This manual has moved the post-acute brain injury industry significantly forward by providing clear guidelines for delivering best practice cognitive rehabilitation. The Cognitive Rehabilitation Manual; Translating Evidence-Based Recommendations into Practice is a significant contribution to the field of brain injury rehabilitation. Never before has research outcomes been made so accessible for use in everyday clinical work. This important volume will raise the bar in cognitive rehabilitation by aiding clinicians in delivering high-quality, empirically-supported interventions to improve the lives of the patients we serve. Cognitive rehabilitation is a dynamic practice between the clinician and the client, not fitting into a typical treatment protocol. This manual provides the kind of support that clinicians need to develop effective and evidence based treatment plans. Dr. Haskins and his team provided a very in depth and precise perspective to cognitive remediation therapy and the goals and objectives needed to meet these needs. Two-day, live, introductory course with authors of the Manual. Printed Manual and 12 hours of continuing education included with registration.